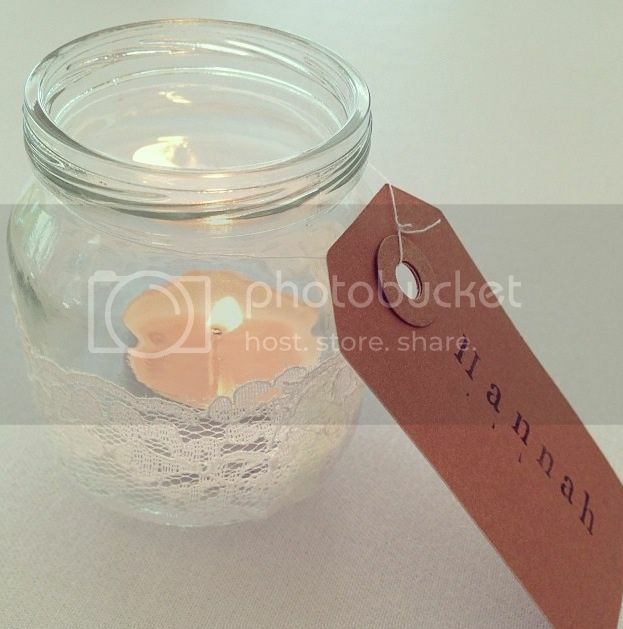 After chucking out what seemed like 100’s of baby food jars (thanks to my fussy little munchkin not appreciating my homemade purée attempts) I had a light bulb moment and decided to upcycle these into tealight holders for my wedding last September. The jars I used were the small 4-6 month ones and you’ll find that they do vary in shape slightly from brand to brand however it wasn’t massively noticeable, but if you want perfect symmetry then stick with one brand (e.g. cow&gate or Heinz). If you or nobody you know doesn’t have any hungry little mouths to feed, I’d recommend posting on Netmums and asking if anyone would mind saving these up for you. I had a couple of friends collecting as well as posting an advert online as Elsa wasn’t a massive eater and soon found I was inundated with jars. In the end I even had to chuck some away I had so many. After I had cleaned out my jars (I found the labels simply slipped off after being soaked in hot water for 5 minutes) and disposed of the lids, I was then set to make them pretty. 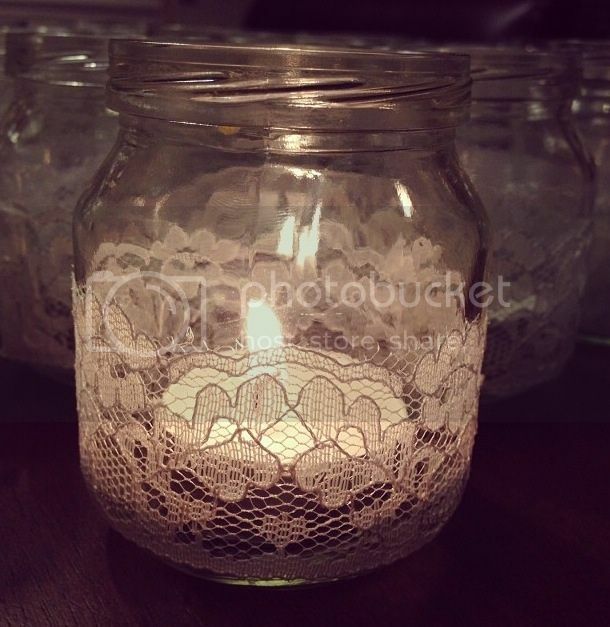 My wedding theme was very much shabby chic/vintage which is why I decided to go with lace (bought from my local fabric shop ‘Fabricland’ for 20p per metre) however these jars can be used in various ways depending on the look you want to go for. 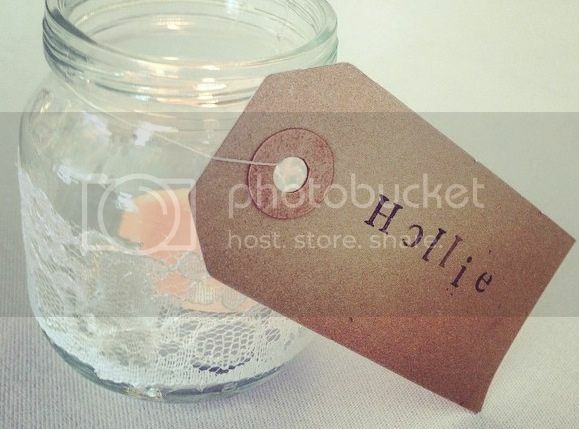 Other ideas include wrapping twine round (soaking this in PVA will make it stick round the jar) or sticking on shells for a beach/coastal look, painting in your wedding colour (I’d recommend chalk paint seeing as the paint needs to stick to the glass) or using ribbon in your chosen colour instead of lace. They don’t even have to be tealight holders – using the slightly bigger 9+ month jars to display flowers. 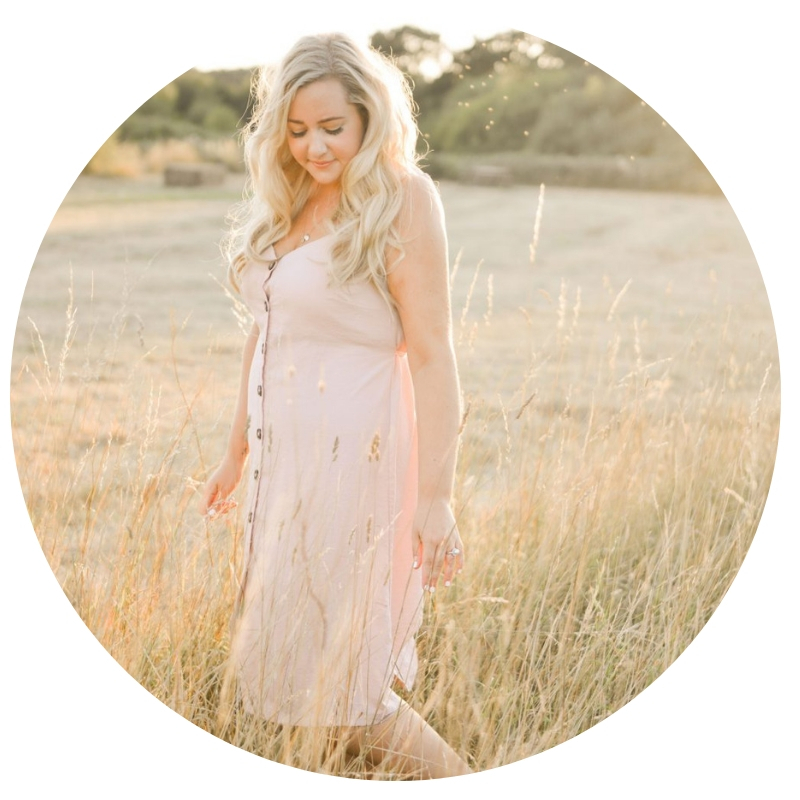 The actual making of the jars was super easy with the help of my trusty glue gun – simply measure the diameter of the jar (21cm including slight overlap), cut lace to size, then glue on using the gun. After this is complete, add a tealight (found cheaply in bulk from ikea, wilkinsons etc). 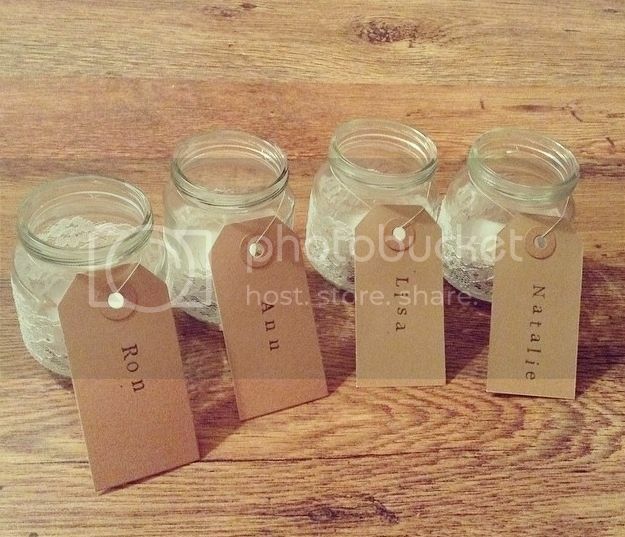 I also used these jars as place names by attaching tags (I used brown for a vintagey look however you can buy them in many colours) bought off a Ebay (seller: glebe1961 – item ID 230886154355) which were 10x5cm and cost £1.85 for 50. 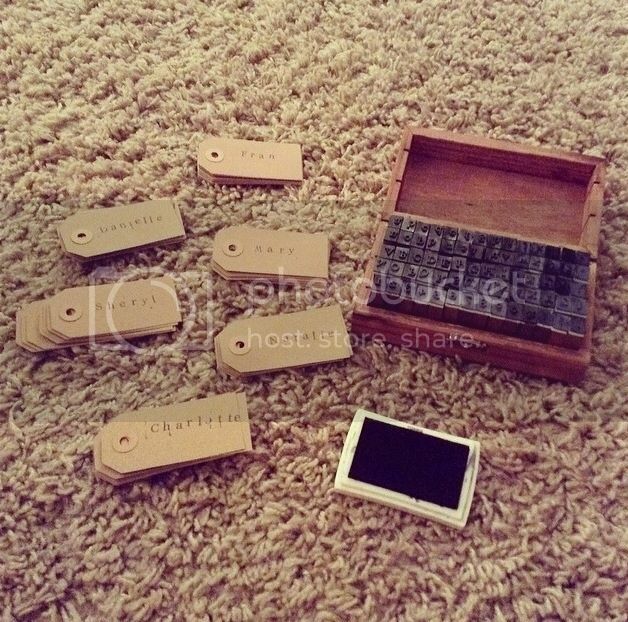 I hand stamped names onto each of these tags, however this took a LONG time so I’d recommend roping some volunteers in to help you do this if possible. The stamp set I used was again off ebay (seller: superdigicity – item ID 350739042457) which cost £5.98. Once complete I used thread to attach the tags onto the jars. Time taken: 1.5 hours to make the jars but probably about 4 hours to stamp the tags and tie them on. 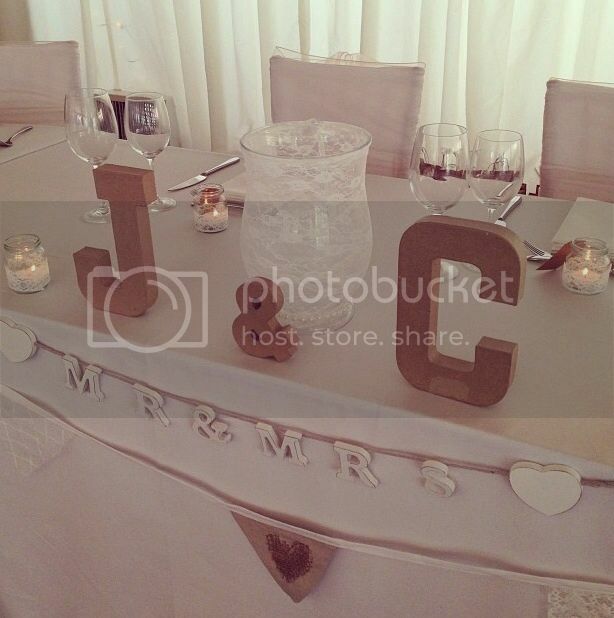 I actually sold the jars on after the wedding via Gumtree for £25 for 50 – the jars cost me £2.20 to make (the lace was the only thing that I paid for) so that was a nice little profit.